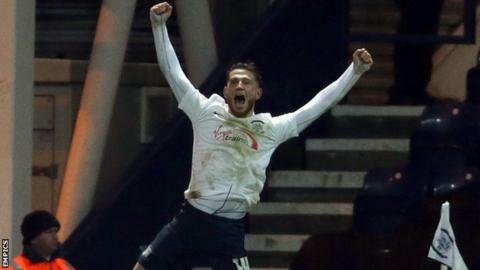 Joe Garner's second-half penalty was enough for Preston to beat managerless Reading in the Championship. The Royals, with Martin Kuhl in temporary charge after Steve Clarke's sacking, almost went behind early on when Adam Reach hit the woodwork. Reach was also denied twice by Jonathan Bond, but the Royals keeper was beaten from the spot after Garner had been bundled over by Paul McShane. Nick Blackman should have levelled, but fired over when one-on-one. Matej Vydra forced North End keeper Jordan Pickford into a late save as Simon Grayson's men kept a clean sheet for the eighth time in 10 league games. But it was not the start Under-21s manager Kuhl would have wanted, with Reading 12th in the table, four points outside the play-off places. Daniel Johnson and Paul Gallagher both saw their efforts for Preston miss the target in the first half, while Blackman's free-kick deflected wide for the visitors. But North End took the lead when Garner slotted home his third goal of the season after McShane, one of three changes made by Kuhl, clumsily challenged him in the area. He almost added a second but his effort from the edge of the box rose high over the bar. "I think when you look at the overall game; we're obviously playing a very talented Reading team. "But we said to the players before the game we had to make sure that we backed up last week's performance and victory with hopefully another one and I thought we were really positive from the start, took the game to them and could have had a couple of early opportunities. "But we kept on going and ultimately I think 1-0 was a fantastic victory for us but also, it could have been a lot clearer for us given the opportunities that we created and nearly took." "The penalty, you're looking at it and it comes from a mistake which at the moment we seem to be making. At the end they tried to give it a go, we had a good chance with Nick Blackman and we come away disappointed. "Whatever it is, a slight tightness or belief or whatever it is, he goes through and you're just thinking 'go on' and he puts it over, but at the beginning of the year he could shut his eyes and hit the back of the net - but that's football. "I believe at the moment I'm in charge until anything happens. I'm sure (the board) are trying to get something in place and hopefully the sooner the better." Match ends, Preston North End 1, Reading 0. Second Half ends, Preston North End 1, Reading 0. Attempt blocked. Daniel Johnson (Preston North End) left footed shot from outside the box is blocked. Foul by Andrew Taylor (Reading). Hand ball by Ola John (Reading). Matej Vydra (Reading) is shown the yellow card. Jordan Pickford (Preston North End) wins a free kick in the defensive half. Attempt saved. Danny Williams (Reading) left footed shot from outside the box is saved in the bottom right corner. Assisted by Matej Vydra. Nick Blackman (Reading) wins a free kick in the defensive half. Corner, Preston North End. Conceded by Paul McShane. Attempt missed. Marnick Vermijl (Preston North End) right footed shot from the right side of the box misses to the left. Assisted by Adam Reach. Andrew Taylor (Reading) wins a free kick in the defensive half. Substitution, Reading. Álex Fernández replaces Garath McCleary. Corner, Reading. Conceded by Jordan Pickford. Attempt saved. Matej Vydra (Reading) right footed shot from outside the box is saved in the bottom right corner. Assisted by Ola John. Ola John (Reading) wins a free kick in the defensive half. Attempt missed. Joe Garner (Preston North End) header from the centre of the box is close, but misses to the left. Assisted by Paul Gallagher following a set piece situation.